An early summer has meant an early onset of autumn as the season of mists and mellow fruitfulness; the mists are slowly becoming apparent in the early morning, but the fruitfulness is all around. 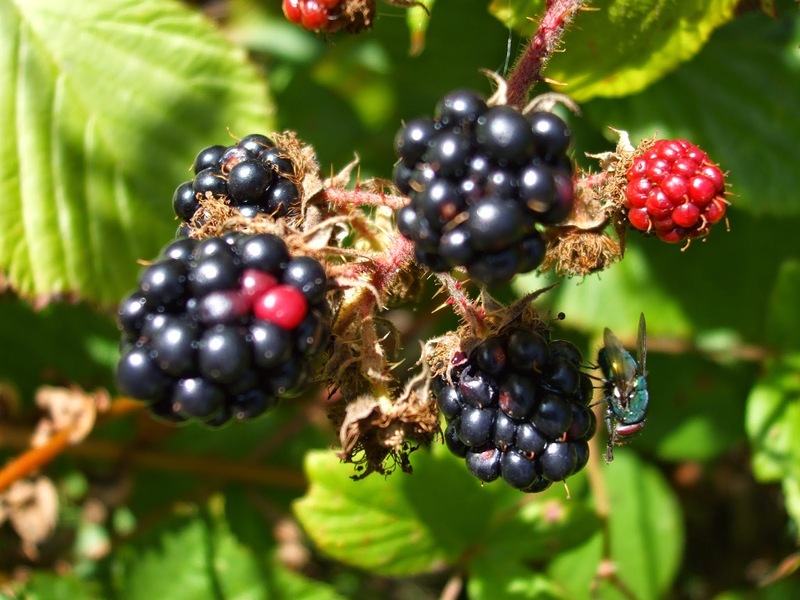 When I visited Yorkshire during the first half of August I was astonished to see hedgerows already laden with ripe blackberries: this filled me with hope for some rich pickings during my retreat at Llannerchwen, and I made sure a couple of large plastic tubs came with me in the car. Sure enough, towards the end of the retreat, on two consecutive warm and sunny days, I walked through the woods picking blackberries, my only company bees, butterflies and a surprise dragonfly. The warmth made heavy clothing too uncomfortable and so I threw caution to the winds and picked wearing short sleeves and cut-off trousers. Not for the first time, I found myself wondering why the plumpest, ripest, juiciest berries are often guarded by the meanest, prickliest thorns and nettles (ouch! ), and a week on my arms and legs still bear the scars of my determination and impulsive, careless moments. Inevitably, I found myself recalling childhood expeditions with my mum to blackberry bushes beside the railway, and then, a few weeks later, helping my dad pick apples from our tree. I recalled the crisp, satisfying sharpness of those first Coxes, relishing the sourness even as my face puckered up against it. Later would come mushroom picking in dark, musty woods; even now, whenever I smell that damp fungal tang I am instantly transported back forty years or so. The purple stickiness of my fingers brought back grape harvests in Italy, and I recalled the blessedness, after a long session, of a splash of cold water poured over my outstretched hands by a co-worker. On the second day of picking I headed for some bushes I had spotted earlier in the week. My route took me past the previous day's bushes and I was amazed to see ripe, black berries on branches I thought I had picked bare. How had I missed these? As I picked it dawned on me that these were berries which, only a day earlier, had not yet been ripe. We talk about the slow work of God, but here I was reminded that God can also work with lightning rapidity. But I also reflected on how berries on the same cluster, receiving the same amount of sun, rain and nutrients, can grow at such different rates - a true mystery to me. Almost a week on, the memory of my retreat lives on in various little ways, not least the apple and blackberry crumble we've been enjoying here in Oxford, and which our Brazilian sister, encountering this for the first time, has pronounced very delicious! And I am very grateful, for the memories and the satisfaction of picking, for God's work, be it fast or slow - and yes, of course, for the deliciousness!